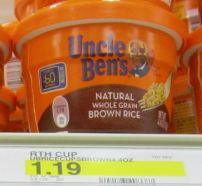 Uncle Ben's Microwaveable Rice Cups only $0.69 w/ Coupon! A new Uncle Ben's coupon just came out. Take it to Target to get a good deal on the single serve microwaveable cups! = $0.69 each wyb 2! NOTE: Not all stores carry this size, but it's still a nice coupon to hold onto for a sale!